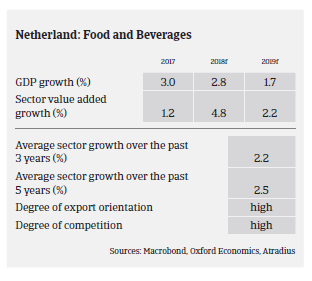 The Dutch food and beverages sector continued to expand in 2018, with value added growth expected to increase by more than 4.5%, and in 2019 more than 2%. Domestic consumption is sustained by continued economic growth and elevated consumer confidence, while export demand has remained robust. 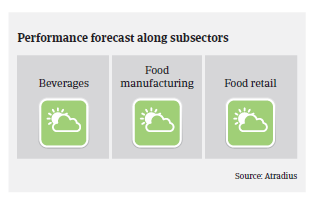 The profitability of Dutch food businesses is generally high, and profit margins have increased in 2018, with a stable outlook for 2019. The domestic food retail subsector continued to grow in 2018, expected to amount to more than EUR 59 billion. Food service (catering, restaurants, leisure, hotels and sales points ‘on the move’) account for approximately 35% of the total food spending, while the food retail share amounts to about 65%. The food service segment continues to grow due to the robust economic performance and the fact that people are eating out more often. A rising share of female workers, growing millennial population, busy work schedules, and on-the-go consumption drive this habit. Supermarkets answered this trend by opening shops with a smaller convenience store variety in busy city centres, at train stations and in business parks. Specialty food retail recorded a decline in sales volume in H2 of 2017 and H1 of 2018, not being able to benefit from the overall growth in food expenditure. There is strong competition from supermarket chains, which have further improved their assortment. Therefore, traditional stores have to become specialty shops, pastry and high-end caterers in order to survive in the long-term. Online food retailing continues gaining momentum. While the market share of online food retail is still small (2.8% in 2017), many indicators show that it will increase sharply in the coming years, up to 9% in 2025. For supermarkets e-commerce is in many cases still loss-making, but also a way to increase market share, bind customers and to keep out new market entrants. The Netherlands is one of the world´s largest exporters of agricultural-food products, second only to the US. The meat processing and the dairy industries are the most important sectors within the food export industry. The business model of the Dutch dairy industry has a very international orientation. Belgium, France and Germany are its main markets within the EU, but markets in Asia and the Middle East are also of major importance. While it is expected that demand for dairy products will increase further in 2019 the operating profits of businesses in the processing industry are under pressure due to low prices for basis dairy products and price competition in infant nutrition in Asia, putting pressure on volume and margins. At the same time Dutch milk supply fell sharply in 2017 and 2018 due to the introduction of a phosphate reduction scheme, as dairy farmers have decreased their number of cows. The Netherlands are the largest importer and exporter of poultry meat in Europe. Market conditions in this segment have been favourable, and financial results will exceed the average of the last five years. For the strongly export-oriented veal and beef segment, business conditions are expected to remain stable in 2019. In the pork segment market circumstances have become more challenging due to increased competition and higher raw material costs. A hard Brexit could have major repercussions, as with 14% of volume and 16% of value the UK is the most important market for Dutch pork. The average payment duration in the sector is 45 days, and the amount of payment delays, protracted payments and insolvencies remains low compared to other Dutch industries, with no major changes expected in 2019. Banks are generally willing to provide loans, while the indebtedness of small and mid-sized Dutch food companies (excluding smaller businesses with less than 10 employees) is low compared to their peers in other EU countries. Therefore, our underwriting stance remains open for most major food subsectors, while being neutral for speciality retail stores and dairy processing due to the issues mentioned above. 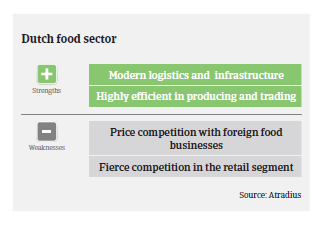 However, risks that could potentially trigger a setback in the sector performance are mounting, as the strong export orientation makes many Dutch food businesses susceptible to geopolitical risks, trade disputes and price/currency fluctuations. Issues like an escalation of the Sino-US trade dispute and a hard Brexit could pose considerable risks in 2019 (e.g. in value added terms, the UK accounts for 8% of Dutch exports and 3% of Dutch GDP).